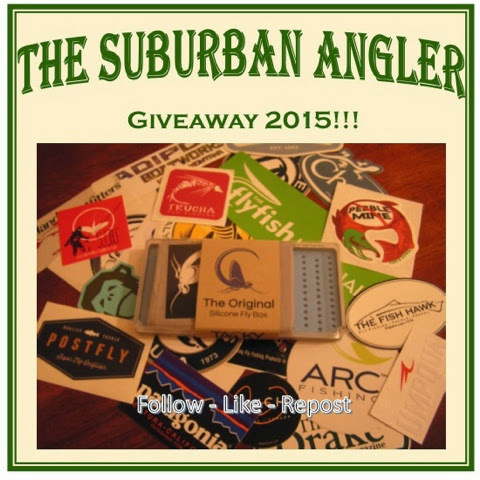 The Suburban Angler: Giveaway 2015!!! The Suburban Angler Giveaway 2015!!! This giveaway has been in the works for several months, and it's finally a go! This is just a small way for me to say thanks for all the support in 2014 and a little bribe to get you to stick with me for all the good things to come in 2015! Thanks and good luck!!! Since you're here, subscribe to the blog! All subscribers get their name entered in the contest, just make sure to comment on this post so I have some way to contact you if you win! The contest will run until midnight eastern time on 01/18/15 and the winner will be chosen by random number generator and announced on 01/19/15 by midnight. This is your chance to win an awesome Tacky Fly Box and logo buff, an ARC Fishing can koozie, plus a pile of manufacturer and fly shop stickers (for your cooler, back window or Trapper Keeper!) that I've collected since IFTD and anything else that I find between now and the end of the contest.